Sweet potatoes take 3–4 months to mature. Leave them in the ground until the roots are full grown and the vines begin to turn yellow. Handle carefully to prevent skinning and bruising. Sugars will increase in storage. 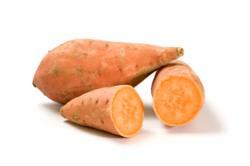 Traditionally, sweet potatoes were 'cured' immediately after harvest. While not necessary, the process does promote longer lasting storage. Proper curing conditions are 85°F at 85% relative humidity for 4 to 7 days with ventilation. Sweet potatoes grow best in light, sandy soils. Once the vines spread to cover the ground, little weeding is required. Do not water during the last 3 to 4 weeks before harvest to protect the developing roots. There are no specific variety recommendations for Santa Clara County yet. Refer to the UC Davis Vegetable Research and Information Center sweet potato overview for recommended varieties for California.